Denon HEOS AVR Home Cinema Amplifier. Available with Online Finance and Free Delivery. 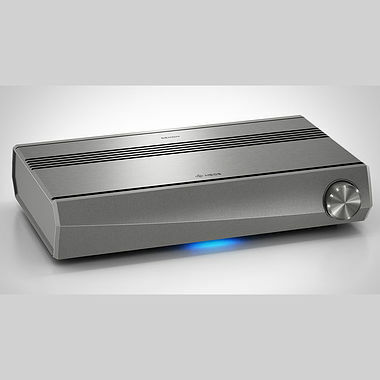 The Denon HEOS AVR Amplifier does away with black boxes and complicated wiring. Combining wired or wireless surround sound with performance and ground-breaking industrial design, the 5.1 channel Heos AVR is ready to drive your speakers as well as any HEOS wireless speaker as surround channels. Opening up the possibility to connect to a variety of different setups, the HEOS AVR will accommodate 2.0, 2.1, 3.1 and 5.1 speaker setups. Drives even demanding speakers in a 2.0 setting, delivering a brilliantly detailed, high-quality sound experience. The ability to connect with any pair of wireless HEOS speakers will allow you to experience stunning virtual surround sound, all the while remaining wire-free. This wire free connectivity also allows the addition of the HEOS subwoofer, adding seismic bass to this already impressive system. Streaming your music wirelessly is made possible through this AVR amplifier. Connect any Bluetooth enabled device to the network and immediately fill your entire home with the music that you love. And with the ability to stream to multiple speakers at the same time, you can play music simultaneously in each and every room in the house. The HEOS app, available via the Apple App Store or the Google Play Store, will put control over your entire system at the tips of your fingers. An easy-to-use remote control is included, allowing control over the HEOS AVR to be as simple as possible and always at hand. There are also six presets, which allow you to quickly and easily choose between your pre-defined settings that have been specifically optimised for your music or movie experiences. Setting up the HEOS AVR is simple. Connection can be made from the AVR to your TV with a single cable. Then download the HEOS app, which will then provide you with easy-to-follow instructions on screen. Thus, the setup of the AVR will take a matter of mere minutes and it will be ready to receive in almost no time at all. Control over your sound - volume, tracks, etc, - are all possible through the app. 4K Ultra-HD is supported, with four HDMI 2.0a/HDCP 2.2 inputs, HEOS have ensured that this amplifier has been made future-proof, providing movies in full 4K Ultra-HD. Combined with 4K support, Dolby TrueHD, DTS-HD Master Audio will work to deliver premium quality, crystal clear sound to fully transform your movies.